Getting their Irish up: the four Donnellys and titular head Tommy. Like a fine Irish stew in the making, The Black Donnellys needs time to find its flavor. But time isn't on the side of seriously sober serial dramas -- at least not this season. So NBC's Hell's Kitchen-set crime saga likely will have a fight on its hands as the Peacock's Monday night replacement for the audience-rejected Studio 60 on the Sunset Strip. Donnellys' premiere episode is a jumble at times, with swerving narration from the jailed "Joey Ice Cream" (Keith Nobbs) used and sometimes abused as a storytelling technique. Keep watching, though. NBC sent the first five hours for review, giving TV critics ample opportunity to settle in while the show settles down. Stay with it and you'll get to know one of the season's most compelling new characters. 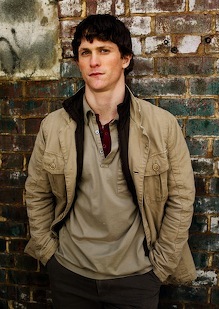 He's Tommy Donnelly (Jonathan Tucker), a hurting, harrowing, heart-in-the-right-place anti-hero. Tommy's lifelong guilt over a childhood mishap has cast him as a protective shield whose lot in life is to keep his three brothers among the living. It's a lot to ask when your oldest sibling, Jimmy (Thomas Guiry), is a drunken junkie and borderline despot. Younger brother Kevin (Billy Lush) also is addicted -- to gambling. And the baby of the family, heartthrob Sean (Michael Stahl-David), turns out to be an easy mark for thugs with lessons to teach. Their home base is the Donnelly family bar, which is oddly lacking in customers other than the four brothers and an earlier unincarcerated Joey. When away from a beer tap, the boys aim to please and protect their widowed mother, Helen (Kate Mulgrew from Star Trek: Voyager). She's a pistol herself, particularly with her two younger sons. Black Donnellys has superior bloodlines. Co-executive producer and creator Paul Haggis directed last year's Crash, which won the Oscar for Best Picture. Sandwiched around that film are his screenplays for Million Dollar Baby and Letters From Iwo Jima. Haggis' Black Donnellys collaborator, Bobby Moresco, also worked with him on Crash and Million Dollar Baby. And in 1996, the two co-created CBS' EZ Streets, an exemplary crime drama that never found enough viewers to sustain it. Black Donnellys, inspired by Moresco's formative years in a tough New York neighborhood, is anything but a spoonful of sugar. The series' opening words -- "So where are the bodies?" -- prompt the jailed Joey Ice Cream to weave a back-and-forth tale of hard-won brotherly love mixed with killings, beatings and thievery. There's also a prototypical bar fight -- at a wake no less. Accompanied by a jaunty Irish tune, the fists start flying after Joey observes, "The Irish have always been victims of negative stereotyping. People think we're all drunks and brawlers. And sometimes that gets you so mad all you want to do is get drunk and punch somebody." The narrative gets to be too much. It sometimes seems as though Joey is auditioning for Last Comic Standing rather than playing ball with his jail cell interrogaters. But future episodes scale him back, with Joey primarily used to sum up the action from previous episodes. Think of him as a colorful, prison orange substitute for prime-time's standard "Previously on . . ." stage-setters. We quickly learn there's very bad blood between the Irish and the Italians, and the Irish and the Irish. Everybody wants a cut, and some are willing to cut off the toes and fingers of welshers. Principal among them is the chilling "Dokey" Farrell (Peter Greene), whose constant companion is an ax. Dokey and Tommy Donnelly are going to be antagonists, with matters heating to a boil in Episode 3. Also in this mix is Jenny Reilly (Olivia Wilde), whose brutalizing husband remains both missing and unseen through the initial five episodes. Jenny's the love of Tommy's life, but can he ever have her? The acts he commits in defense of his brothers have made her afraid to get too close. The series deftly paints Tommy into corners, prompting a painful series of lies and betrayals. In a sense he's doing what's right, but the cost of living keeps rising. Tommy is a Boy Scout with dried blood on his troop insignia, an amalgam of Michael and Sonny Corleone, hold the Fredo. 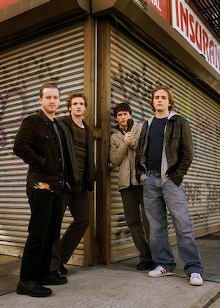 Black Donnellys initially was earmarked for ER's Thursday slot, but the venerable medical drama's Nielsen ratings were too good to give way. Plan B finds the show in a much tougher spot. Near the end, hardly anyone was watching Studio 60, which will make it doubly tough for this oft-grim serial to recruit viewers almost from scratch. In the end, it's all together too likely that Black Donnellys will find it difficult to escape one of its weekly cautionary quotes. Such as this one at the outset of Episode 3: "To be Irish is to know that in the end the world will break your heart." Hey, whatever happened to the luck of the Irish? That's what this show needs and deserves.